The MV Norderoog as part of its maiden call. GT USA, the US arm of UAE-based global ports and logistics company Gulftainer, has welcomed to its Canaveral Cargo Terminal (CCT) in Florida, US, the MV Norderoog as part of its maiden call of StreamLines NV’s new Blue Stream service. 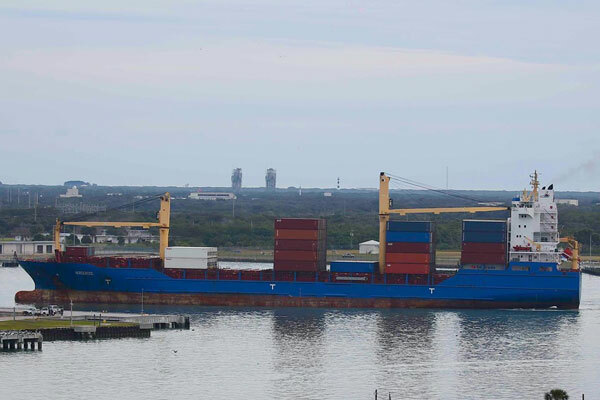 The Blue Stream service connects Port Canaveral to Europe, the French West Indies and Central America, said a statement from GT USA. The service, which employs five ships, is operated by StreamLines NV, part of the Seatrade Group. The service provides refrigerated and dry container service to and from the Canaveral Cargo Terminal, with a focus on fresh produce and perishable cargoes. The five weekly vessels includes the MV Max Winner, MV Star Stratos, MV Victoria and MV Conti Salome, said the statement. The 528-foot MV Norderoog has a capacity of 1,368 TEU (twenty-foot equivalent units) and 258 reefer plugs, it added. The vessel arrived at the CCT on January 31, and Peter Richards, CEO of GT USA and managing director of Gulftainer, marked the historic vessel call by presenting to the crew a commemorative plaque that was accepted by Captain Oleg Tereshenko of the MV Norderoog, who thanked the GT USA and Port Canaveral Authority representatives for their warm welcome. “This vessel call showcases the capabilities of Gulftainer and the Canaveral Cargo Terminal to offer our customers the world-class operational efficiency they need to expand their import and export cargo capabilities from Florida,” he said. The terminal is able to turn around cargo between Port Canaveral and the Orlando area within one to two hours, the fastest transit time when compared to other container terminals in the state. The Blue Stream service will serve Central America to Port Canaveral in just three days and will offer the one of the fastest transit times - just 11 days - between Florida and Europe, further added the statement. From Canaveral Cargo Terminal, vessels in the Blue Stream service will proceed directly to Rotterdam, Netherlands, with calls in Tilbury, UK, and Radicatel, France. After departing Europe, the schedule loop takes the vessels to the French West Indies ports of Fort de France, Martinique, Pointe a Pitre, Guadeloupe and Phillipsburg, St. Maarten – serving a Caribbean market based westbound out of Europe that is quite familiar to StreamLines. From St. Maarten, the vessels then proceed on to Moín, Costa Rica; Puerto Cortés, Honduras; and Santo Tomas, Guatemala; and from there directly on to Port Canaveral.